So what is an anode rod and what does it do? Most water heater tanks are steel with a thin glass lining to protect the metal from corrosion. Since the lining eventually cracks, tanks have a second line of defense against rust: a long metal “anode rod” that attracts corrosive elements in the water. How important is this service to the life of my water heater? Replacing your anode rod at regular intervals may increase the life of your water heater, saving you money, time and the inconvenience of having to replace your water heater. One of the most important considerations in having a normal life span for your water heater is whether the anode rod is performing it’s job – to divert corrosive action away from the tank walls to the anode rod. 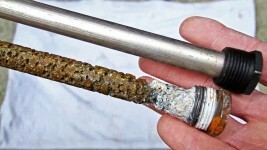 Why should I call MICRO PLUMBING INC. to replace my anode rod? Micro Plumbing Inc. is a professional plumbing company, in the Omaha area, that is here for you. We come to you with the utmost in honesty, integrity, professionalism and knowledge. We will inform you of what is needed to service your water heater and not up sell you on things you don’t need. We are for the customer and for the long-term relationship of our clients! BIG OR SMALL WE DO IT ALL!! You are here: Home > Uncategorized > When is it Time to Change the Anode Rod in your Water Heater?